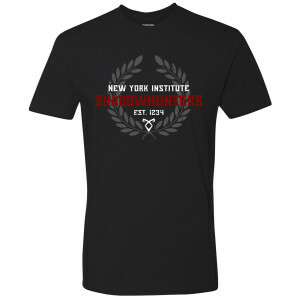 Represent headquarters with this Shadowhunters Laurel Wreath Institute T-Shirt. Love my t shirt. Prefect size. Design is great. I cant say it enough, its prefect. It fits well, very comfortable. Great t-shirt! It fits very well and it's comfortable. The design is awesome. I got a size medium and I'm 5'4, 160 lbs, and heavy in the hips. Now if only we could get Shadowhunters renewed!